The plush interior and the Fresh Foam combine to give the Vongo a very comfortable ride. It has respectable durability, according to many runners. New Balance’s Vongo has a sufficiently stable ride that is never jarring, based on some comments. The 4mm drop enhances the turnover from the heel to the forefoot, observed a handful of runners. Shoe breathability is afforded by a very breathable mesh and a perforated midfoot saddle. It is quite light for a stability shoe. A large number of runners loved the correct blend of cushioning and stability. The price tag is a little harder to swallow for some runners. Some runners think the cushioning is a bit firmer than expected or as advertised. The stability shoe in the Fresh Foam collection, the Vongo uses an innovative midsole setup to deliver mild stability. 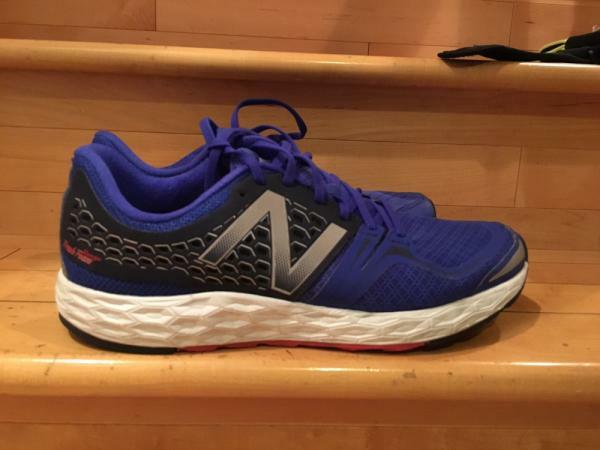 New Balance raises the medial side a bit higher than the lateral side so the overpronator rolls towards the elevated part of the shoe to curb overpronation. It has superior comfort and breathability. The Fresh Foam Vongo is one of New Balance’s best lightweight trainers. This morning, I passed the 300-mile threshold on my New Balance Fresh Foam Vongo running shoes, so it’s time for an assessment! I use my Vongos mostly for mid-distance recovery runs, although I did race The 2017 Woodlands Marathon in them (actually a 25.4-mile race; long, sad story…read more here: http://www.khou.com/news/). Other than that one marathon, though, I averaged about 6 miles per run in these shoes and they haven’t been too disappointing. Though I must say, they are not my favorite pair of shoes. With a very wide sole, they are almost reminiscent of an Altra shoe from the bottom. Add to the wide platform the built-in stability on the arch, and you have a solid shoe. I’ve run in several stability shoes and these are a cut above, providing motion control, but nothing felt out-of-place or foreign in my arches. 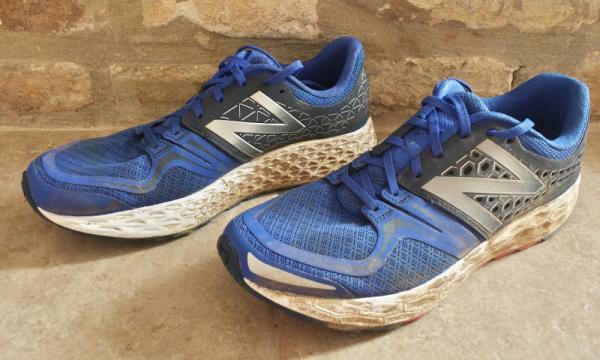 There are no poking posts or jarring wedges that are noticeable on the inside of my foot, which means New Balance has done a great job of keeping my foot from rolling too much, while still allowing my toes to splay and flex as needed. For me, additional stability is provided with its low drop compared to other motion control shoes I’ve worn. Other stability shoes with a higher heel-to-toe drop seem to force my foot into a forward position, but the Vongos allow my heels to rest down a bit, allowing for a more natural foundation. But, that being said, I’ve found that they are a little TOO stable. I have nearly twisted my ankle more than once while running in these shoes. Because of the stiffness and height of the shoe, uneven surfaces can be challenging, as I found it difficult to prevent my ankle from rolling over. These shoes have high cushioning but low responsiveness, which can be dangerous for me on faster runs. Speaking of speed, I found it difficult to do speedwork in these shoes since they are heavier and so bulky. I know you are not supposed to do it, but I wear my running shoes to the office some days, and my Vongos are my choice of casual wear shoes. This has nothing to do with running, I understand, but these shoes are very comfortable on the inside, and provide tremendous stability while walking about. Another thing I like about these shoes is the wide toe box. My forefeet have ample space to do whatever they need to do while running. Also, I expect these shoes to go the distance. I’ve seen no indication that they will not be able to surpass 500 miles. I will continue to run in these shoes, but, as I did today, I will limit my runs in my Vongos to recovery runs. I have to watch where I step so I don’t roll my ankle, which means I can’t move very fast. I will also continue to wear these shoes as everyday shoes since they are so comfortable to walk in. If that makes me seem like an old dad, well, I guess can live with that. Despite its bulkier shape, the Vongo has a very pleasing silhouette that comes in four appealing colour ways. The blue/orange style that I purchased looks great while I'm working out, and can also be worn with jeans if needed. The other colours are also great choices for both athletic and casual wear. Upon first trying on the shoe, I knew that it was the shoe for me. It has an accommodating fit; I have a slightly wide foot and they fit snug but not tight in any way. I went with my true size and they fit slightly big, so I went half a size down and it was a great fit. Would highly recommend this shoe to anyone with a regular to slightly wide foot. The $170 CAD is a bit steep for a runner, and as a student, it was a tad out of my budget. However, it is a great quality shoe even for the price. Even for the quality though, if the price was lowered by $20, I believe the shoe would sell better. Overall, a very good quality shoe but slightly expensive. The Vongo boasts a fresh foam midsole that provides great cushioning and comfort no matter how long the run is. While cushiony, I still felt that the shoe was responsive and was bouncy enough for my needs. The shoe provides mild stability for the slight pronator because of the denser foam on the medial side of the shoe. As a mild pronator myself, I feel that the support is adequate and not overly restrictive. The New Balance Fresh Foam Vongo is a slightly expensive shoe but makes up for it with fantastic cushioning and overall quality of the shoe. It provides adequate, but not overly rigid medial support and is great for the mild pronator. I highly recommend this shoe and it has been one of my favourite runners I've ever worn. The Fresh Foam Vongo fits a little large. Unless you prefer that, you might consider going down half a size. Other than that, the fit is mostly standard. It seems a little wide in the forefoot, going along with the recent trend of wider toe boxes. I’m not a big proponent of this trend, but evidently, others are. In this regard, I’ve seen worse; the front of the shoe is noticeably wide, but it doesn’t appear to affect your stride like some clown shoes out there. I wish there were more arch support, but I say that 50% of the time. If you’re flat-footed, you might love this shoe. This is one of the cushiest shoes I’ve worn, which is sort of impressive for its moderate weight. At times, you feel like you’re sinking into the shoe, but when you run, it doesn’t feel like you’ve got pillows strapped to your feet. Instead, there’s more of a bouncy feel, springing you forward. New Balance calls this a stability shoe, then at the same time refers to the shoe as “mild stability” and also calls it “a greater level of support.” In any case, this certainly isn’t a neutral shoe. It’s not the most flexible shoe either; when you corner, the shoe “wants” to make full, balanced contact with the ground, rather than sticking to one edge. At the same time, your stride mostly feels natural, so “mild stability” isn’t the worst description. It’s only when cornering that you and your shoe might get into an argument. The heel of the shoe has a noticeable slope to it, probably to correct for pronation. As a mild pronator myself, this is welcome. Perhaps my favorite feature of this shoe, the tread pattern works for many uses. My training runs are evenly split between road and trail, and the conditions on both of those vary. Concrete, asphalt, “roads” in various states of repair, grass, gravel, dirt, woodchip trail. These are possibly the best door-to-trail shoes I’ve worn, and they’re not even intended as such. When you’re on road, you feel like you’re wearing road shoes, and the grip on trail rivals that of dedicated trail runners. Oh, and they didn’t make the outsole white, thank goodness. At least not the bottom of it, like half the shoes out there. Shoe designers who use white must have never tried running. If I were going on vacation for a week and could only bring one pair of running shoes, these are the ones I’d bring. If I were re-designing this shoe, I’d size it down half a size, shrink the toebox (personal preference), and raise the arch. That’s about it. For me, I wasn't finding any ill-effects, any, kind of, negative consequences. New Balance dives into the lightweight stability trainer in the Fresh Foam series through the Vongo. The mild stability is delivered by making the medial side a bit beefier and higher than the lateral side. This design offers gradual and unobtrusive support for the mild overpronator and the runner who loves ultra-long runs. Further stability is enhanced by a slightly wider and straighter footprint. The Fresh Foam continues to be the main technology that anchors an entire series, of which the Vongo is now a popular part. It is a lightweight foam that is engineered after painstaking study based on the biomechanics and needs of runners. The Fresh Foam offers a slightly firmer and responsive ride. A new AirMesh upper makes every run extremely breathable. New Balance sprinkles the right mix of flexibility in the shoe to give it better stretch in the right area. It is of minimal nature and one of the reasons why the Vongo belongs to the lightweight stability category. The fit is very standard. 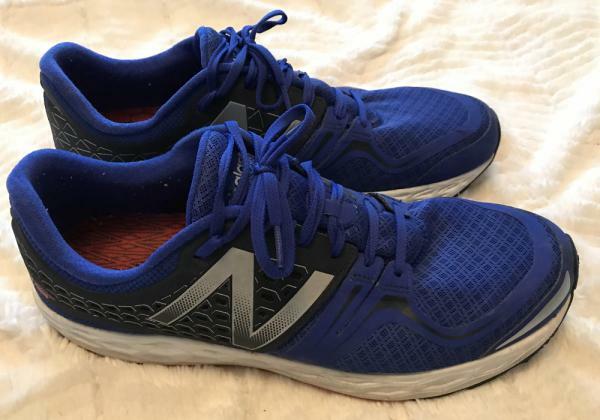 Most runners should be able to enjoy their runs in the New Balance Vongo because the forefoot has adequate real estate for the toes to splay and to accommodate runners whose feet are a bit wider than usual. Medium and wide are the available widths. The standard sizes are from 6 to 15 for the men’s and 4 to 12 for the women’s. The outsole is dominated by blown rubber in most parts. There are various lugs of different sizes and shapes that afford excellent traction on the road and groomed trails. A noteworthy inclusion is the deep and substantial cut that runs from the heel to the midfoot. It increases flexibility and helps with the movement from the heel to the forefoot. The full-length Fresh Foam keeps the cushioning generally consistent and improves the transition in the gait cycle. The innovative technique of making the medial side a bit firmer and more elevated smoothly and gradually holds off overpronation. Fans of New Balance should recognize the signature plush, but firm and responsive cushioning. This midsole foam is also present in the New Balance Vongo v3. The bootie-style construction offers a glove-like fit. With a seamless construction, the foot-wrapping security and comfort are very evident. New Balance employs a very breathable AirMesh that is also very light and durable. There are synthetic overlays for more support and structure. For better cushioning, support, and fit, a molded sockliner is found in the interior of this shoe.